The Northern Lights are of one of the most magnificent natural performance of nature, multicoloured light shows that is usually seen in the areas close to the earth poles. The dancing lights are also known as Aurora Borealis and are formed by gaseous particles charged by the sun colliding the earth’s atmosphere. Every northern lights performance is the totally unique experience that could not be compared to anything similar you’ve seen before. It’s like shifting dance of many night rainbows and lots of shimmering green ribbons of light forming a spirituality uplifting experience that everyone should experience at least once-in-a-lifetime. 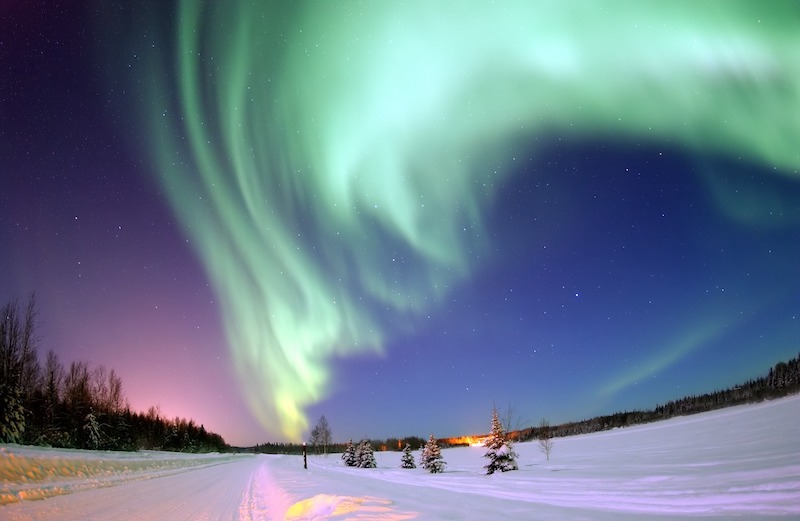 The northern lights are most frequently visible in the Northern Scandinavia, which is called the Aurora zone as well. The visibility of the northern lights depends on the geomagnetic activity and we’re currently in the declining phase of the sun’s activity cycle, that’s why the northern lights are more likely to be visible on the localized area in the Aurora Zone. As sun activity is slowing down, it will be extremely important to head to the north to increase your chance of experiencing the northern light show. What else, to make sure you witness the spectacle at its very best it’s recommended to make sure that you are far away from any significant light sources from large cities and ski resorts, as it can dull the visibility of northern lights. In Finnish Lapland the Northern Lights are dark enough, therefore could be experienced on average 200 nights a year, unfortunately, Finland is often overlooked in favour of its neighbours Sweden and Norway. The low density of human population and lot’s of the spectacular gorgeous lake, fell landscapes and forests are totally free of any additional lights sources creating the perfect conditions for witnessing the northern lights. Finland has a few share of places where it’s recommended to search for the northern lights. In the north-east, destinations such as Moutka, Sarriselka, Moutka and Inari are very popular with northern lights hunters. In the west, Jeis, Harriniva, Torssieppi all could offer great conditions for experiencing the northern lights. The exceptional place to enjoy your winter vacations to the fullest is Igloo Northern Lights Hotel. This hotel is specifically designed for seeing northern lights, as it has nicely designed and very comfortable igloos with the glass roof to watch the northern lights all nights in its full glory. It is located in Finnish Lapland, just 155 miles north of the Arctic circle and is considered one of the best place to witness Aurora Borealis. A night under the stars is one thing, but the view of Northern Lights from your own glass roofed, warm and comfortable igloo is the totally different experience. Each igloo has thermal glass walls and ceilings and lets keep it cosy and warm enough even on the coldest nights in the Lapland. The igloo glass is frost protective and let's maintain crystal clear windows to enjoy the views even with the temperature drops to around -20. The igloos are small enough to be efficiently heated without wasting too much energy and are the comfortable fit for two people. The view of the northern lights cannot be guaranteed, however, the resort constantly monitors weather conditions and informs the visitors when to keep your attention focused on the sky. This Arctic Resort is divided into two villages, the East and the West one. Each one of them has their own wooden cabins, restaurant, reception and activities. It is totally recommended to enjoy various winter activities at the resort. One of the most thrilling ones is winter Husky Safari we’re definitely recommending anyone who is able to try this activity, to do so. It’s like a dream-like sensation being close to everything - snow, dogs and of course animals. It is no longer available for explorers or professionals with carefully explained safety instructions and personal guide, guests can fully enjoy this exciting Husky experience. Another unforgettable experience that we do not recommend to miss is one-hour snowmobile safari visiting the Santa Claus village. This activity takes you to the heart of nature and gives an opportunity to master the art of driving on the pure snow. In addition, in the village, you will get to meet traditionally dressed people and learn more about Lappish culture, as well as experience the secrets of Santa Claus and it’s little helpers. There are more activities that you can enjoy at the Arctic Resort that include: ice fishing, cross-country skiing, reindeer safari. All in all, the northern lights and Igloo glass resort experience it’s truly magnificent one that everyone should have a chance to get this experience at least once-in-a-lifetime. Our Northern Lights tour combines both the best that Finnish Lapland has to offer and a great opportunity to witness the remarkable natural performance of Northern Lights. Don't hesitate to contact our fjords cruises specialist and get special recommendations for your trip.